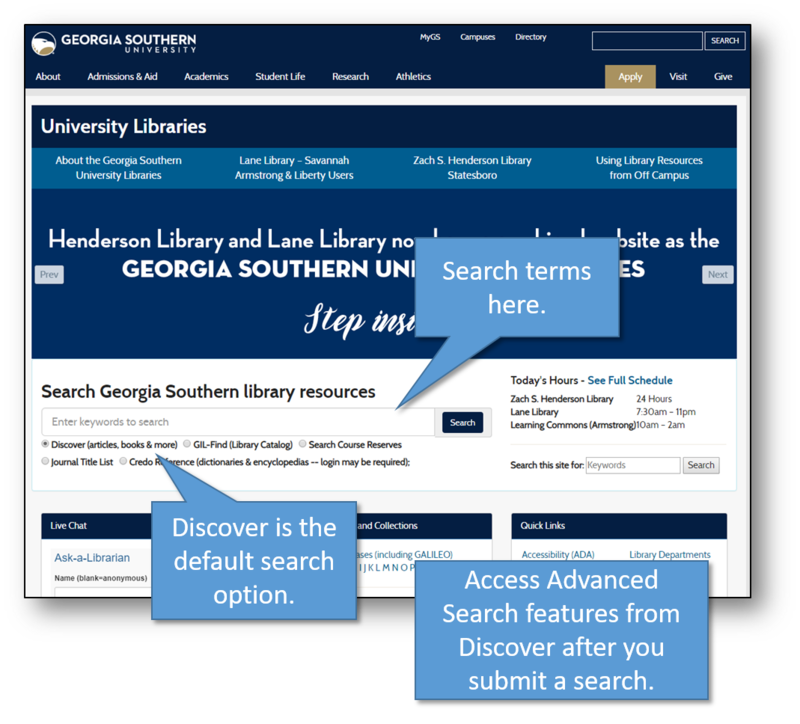 Discover @ Georgia Southern is a bit like Google for the library's print and electronic resources. Discover helps you find print books, ebooks, journal articles, videos, and much more from the library catalog, our research databases, and from open access journals available online. 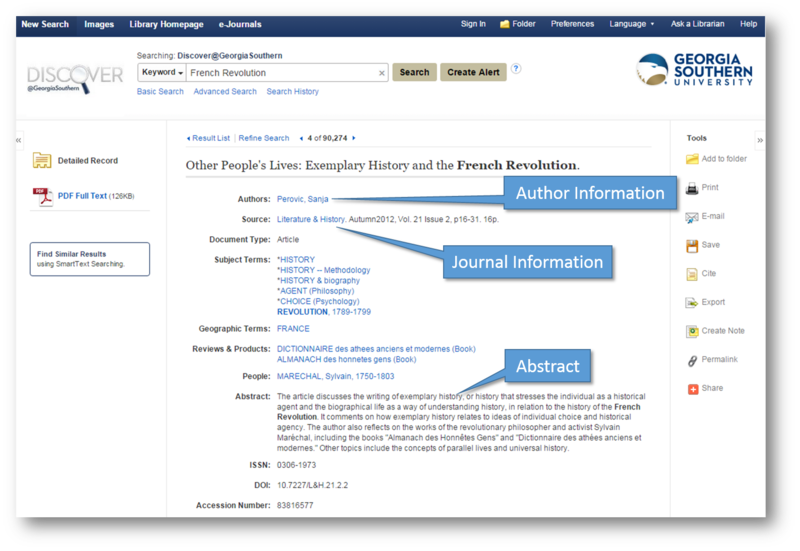 Also, Discover helps you sort and filter your results, and access the full text of the resources you want. Most ebooks available from the library's EBSCO databases can be downloaded and read offline on your computer or mobile device. 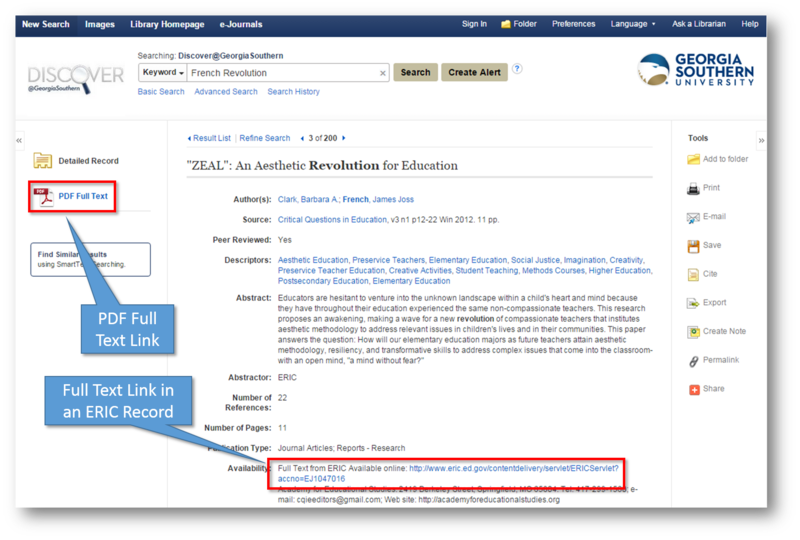 For instructions, see the library’s FAQ article on downloading ebooks from EBSCO Databases. How do I evaluate my results? How do I access the full text of my results? How do I request ON DEMAND titles using Discover @ Georgia Southern? 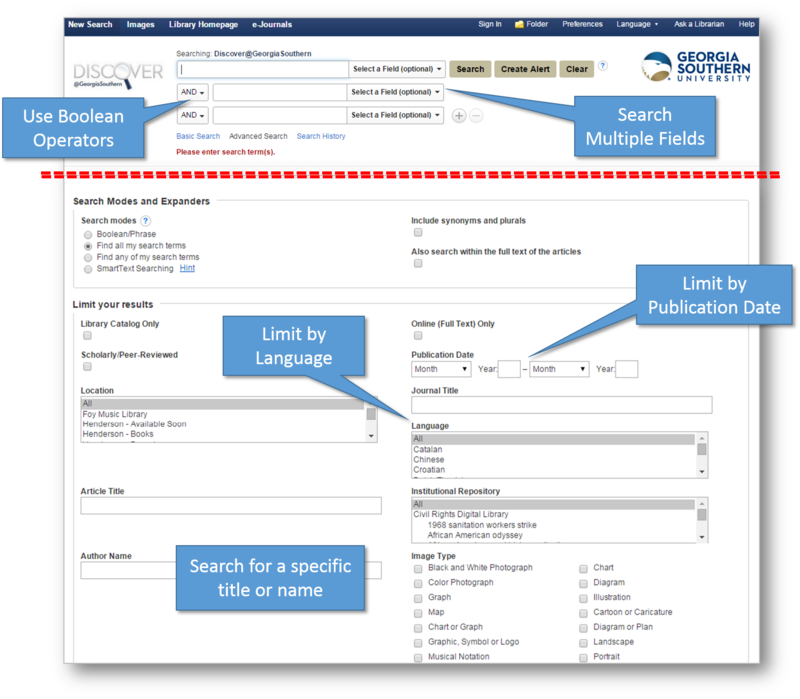 You can search Discover directly from the library homepage or from any Discover search box on the library's Research Guides. To perform a basic keyword search, type your keywords into the search form on the homepage and click "Search." This will take you to the results page, which lists all the resources Discover found related to your topic. Once you are on the results page, you may revise your search terms using the search box at the top of the page. On the homepage search form, Discover is the default search option. Access Advanced Search features from Discover after you submit a search. If you are off-campus, after you click "Search," you may need to click on the yellow "Guest" bar at the top of the results screen and login with your myGeorgiaSouthern username and password. This will give you full access to Discover's full-text content. Discover offers two ways to access Advanced Search features. Either click on "Advanced Search" under the search field on the library homepage, or click on "Advanced Search" under the search field that appears at the top of any Discover results page. Once on the Advanced Search page, use the advanced search features to search multiple fields like title and author, and to combine search terms using the Boolean operators AND, OR, and NOT. Also, limit results by date range, resource type, and more. Many of the search features on the Advanced Search page also appear in the limiter panel on the left-hand side of every Discover results page, which is discussed under "How Do I Refine My Results" below. The easiest way to refine your results in Discover is to use the limiter panel, which is the vertical menu that appears to the left of your search results on any Discover results page. 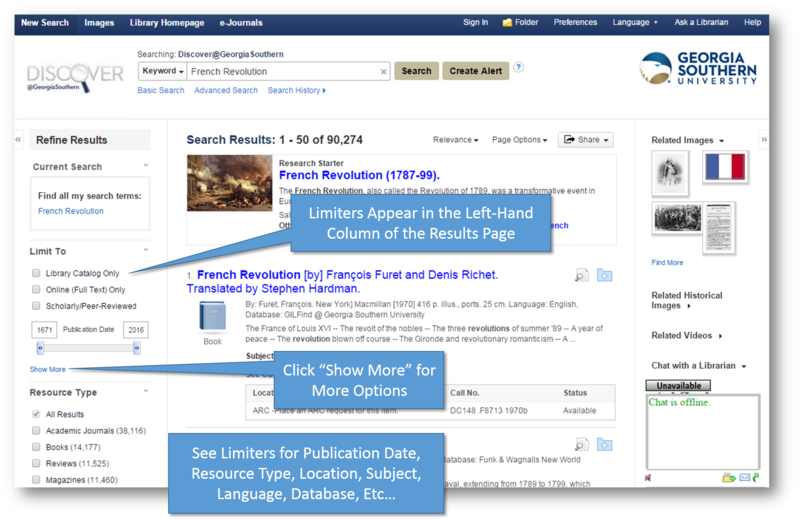 Use these limiters to filter your results to full-text resources only, scholarly/peer-reviewed resources only, date range, content type, subject, language, database, and more. *Please note, the limiters you set in your original search may not be kept when you change your keywords in the search field at the top of the results page and click "Search." You may need to reset some limiters if you change your search terms. Discover gives you a range of information about the results you find on the results page. Your results appear in the wide column in the center of the results page. Hover your cursor over the magnifying glass icon to the right of any result title, and detailed information will appear in a text bubble, often including an abstract. For more information, click on the result's title and you will be taken to the detail page for the result. This page includes additional information about the item, which you can use to evaluate it before using it for your research. 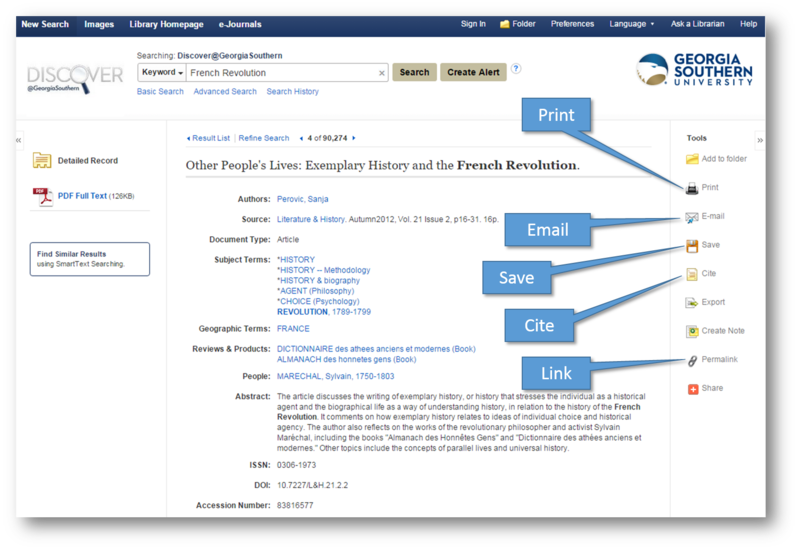 Use the tools in the right-hand column of any item detail page to print, email, save, or cite the result. 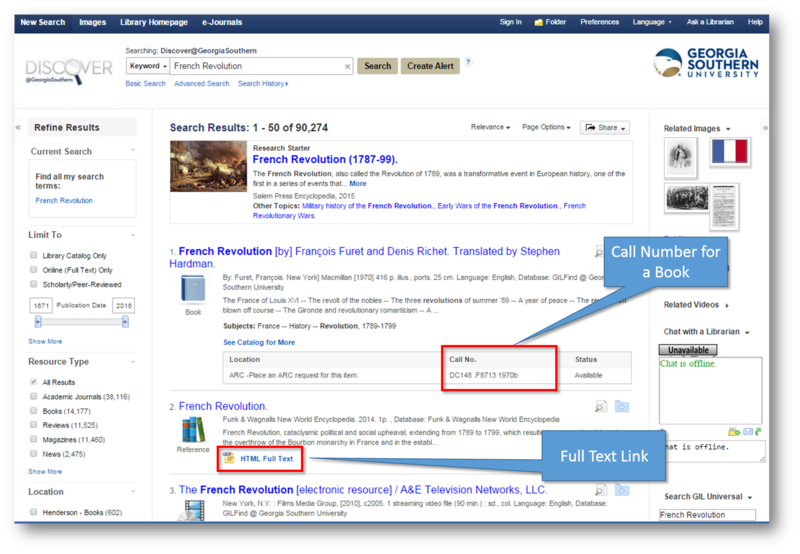 When you are ready to access the full text of a result you've found, look for the Call Number (i.e., "Call No.") 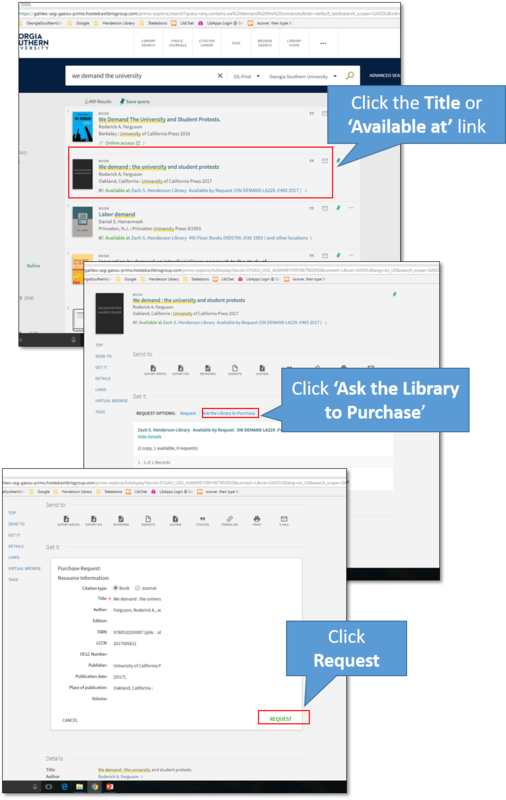 if the item is on the shelf in the library, or click on the "full text" or "Find It" link for the item. Because Discover includes results for many different databases, full text links can look slightly different from item to item. Most full text links should appear at the bottom of the item entry on the result page, or they may appear on the left-hand side of the screen or in the item details on the item detail page. If you are unable to access the item you are looking for, do not hesitate to submit an ILL request using ILLiad or any Find It link in Discover. Find more information on ILL policies and procedures on this page. Of course, if you are having any technical difficulties using Discover or trouble accessing full text for the items you want, do not hesitate to contact a librarian! While searching GIL-Find or Discover @ Georgia Southern, you may notice that some newer books appear with the messages ON DEMAND or "Available by Request." If you would like to read one of these ON DEMAND books, you can request that the library purchase it for the collection and we will notify you when it is available. Most eBooks are available within two business days, while most print books are available within one or two weeks. In addition to requesting ON DEMAND books, Georgia Southern students, faculty and staff may request any resource by completing the library's online request form. Furthermore, faculty and staff may request books via GOBI by contacting their Library Liaison, or by contacting Debra Skinner at dskinner@georgiasouthern.edu. Request ON DEMAND books directly via Discover @ Georgia Southern by following the instructions below. For GIL-Find, see these instructions. 1. Click See GIL-Find for More Details & Request Options. You will be directed to the GIL-Find library catalog. 2. If you are not already logged into your Library account, click to Sign in in the upper right-hand corner. Click on the appropriate login link for your borrower status. Login to your account using your MyGS username and password (Georgia Southern students, faculty, and staff). Once you are logged in, you will be returned to the book. 3. Click on the Title of the book or the Available At link associated with the record. 4. Click Ask the Library to Purchase. A request form will appear. 5. Complete the form and click Request. Your request has been submitted. You will be contacted by the library with the status of your request shortly. If you have any questions, please contact the Information Services Desk at (912)478-5645. Please allow at least one business day for a member of the eTeam to respond to your support request. Time to resolve requests is contingent on complexity and approval by appropriate stakeholders. For more information on eTeam support tiers, stakeholder review, and communications, see this eTeam Support FAQ entry.